To much of the American populace, tonight [Halloween] is a night of goblins and ghouls, vampires and witches. These monsters are actually characters found in old myths and fairytales. People have always transformed the things they feared or hated into something “other,” for the “other” is far easier to accept than confronting the fact that terrible things are done by real people, especially family members. The Torah itself notes only that Ishmael was “playing/mocking” (Genesis 21:9). The Midrash, explains further: “‘Mocking’ alludes to adultery. He [Ishmael] climbed over the garden fences, hunted married women and violated them... ‘Mocking’ [also] alludes to idolatry. He built altars, hunted grasshoppers and sacrificed them on [the altars]. Rabbi Azariah said: ‘Ishmael took bow and arrow and, pretending to be jesting, shot toward Isaac [with the intention of making it look like an accidental killing]” (Genesis Rabbah 53:11). In Judaism, of all the crimes that a person can commit, adultery, idolatry and murder are considered the most repugnant. According to halacha, these crimes are so monstrous that, in certain situations, one who is faced with the choice of committing one of these crimes or losing one’s life, should be prepared to die. One can only imagine how challenging it was for Sarah to tell Abraham about these Jekyl-like qualities of his eldest son Ishmael. In fact, Abraham refused to take Sarah’s word and banish Ishmael until God personally confirmed that banishing Ishmael was the proper decision (Genesis 21:12). If you are a parent, recognize how important your actions are to your children and do not hesitate to rebuke them as needed. “It was taught: There is no measure [of reward] for visiting the sick. What is meant by, ‘there is no measure for visiting the sick?’ Rabbi Joseph thought to explain that: Its reward is unlimited.... Rabbi Abba son of Rabbi Hanina said: He who visits an invalid takes away a sixtieth of his pain” (Nedarim 39b). Bikur cholim, visiting the sick, is one of the prime examples of mitzvot bein adam l’chavero (mitzvot between one person and another). In fact, beyond just being an example of how one can do something caring for another person, the mitzvah of bikur cholim is considered one of the methods by which a person can “walk after the Lord your God” (Deuteronomy 8:4). In Genesis 17, God commands Abraham to circumcise himself and all of the men of his household. The chapter concludes, “In the self-same day was Abraham circumcised, and Ishmael his son, and all the men of his house, those born in the house and those bought with money of a foreigner, were circumcised with him” (Genesis 17:26-27). The very next verse, the beginning of Chapter 18:1, states: “And God appeared to him by the Plains of Mamre, as he sat in the tent door, in the heat of the day.” Traditionally, it has been understood that God’s visit was to be with Abraham while he was recuperating from his circumcision. Why does Rabbi Abba state that bikur cholim takes away a sixtieth of a sick person’s pain? When one visits a person who is ailing, one not only distracts them from the pain or discomfort of illness, but also reminds the sick person that others care about him/her. If you know someone in the hospital, make time in your schedule to visit them. On 13 MarCheshvan, 1960, Rabbi Haim Nahum Effendi passed away in Cairo, and thousands of people - Jews, Muslims and Christians - attended his funeral. Rabbi Nahum (born in Izmir, Turkey - 1872) was an extraordinarily intelligent person with an exceptionally diverse education. He received his formal Jewish education in Tiberias, his secondary education at a French lycee, a degree in Islamic law from Constantinople, and attended the Sorbonne’s School of Oriental Languages while at the same time attending the Rabbinical Academy in Paris. He then returned to Constantinople and taught at the Turkish Military Academy. Rabbi Nahum’s unusual background and eclectic interests earned him great respect. From 1909 until 1923, he served as Hacham Bashi (Chief Rabbi) of the Ottoman Empire and was granted the title of “Effendi” (Lord) by the Turkish government. 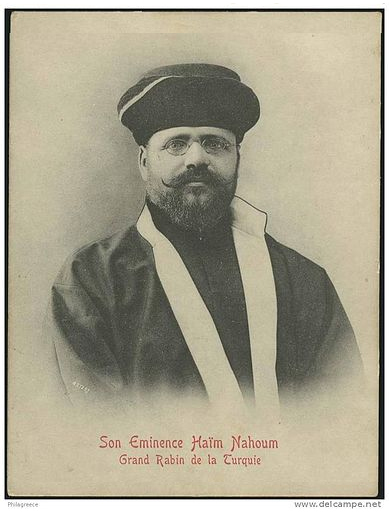 In 1923, Rabbi Nahum agreed to become the head of the Jewish community in Cairo, and thus the Chief Rabbi of Egypt. Here, too, Rabbi Nahum became a man of noted success within the greater society. He was soon appointed a Senator, he helped found the Royal Academy of the Arabic Language, and was instrumental in making possible the reconvening the Society for the Historical Study of the Jews of Egypt. As Chief Rabbi, he also made connections with the Jews of Rhodes and the Beta Israel in Ethiopia. With the rise in Arab nationalism in the late 1940s, life for Egyptian Jews became increasingly difficult. There was an abundance of political intimidation and economic oppression. Although he gave into government pressure to denounce Zionism (using vague, meaningless phrases), he held firm in his refusal to have synagogues recite prayers for an Egyptian victory in the 1948 war. Ignoring his own failing health (and blindness), Rabbi Nahum spent his final years in service to the greatly diminished Egyptian Jewish community. He was 88 years old when he died. Give honor to the leaders of your community. At the end of the patriarch Jacob’s life, Joseph brings his sons to his father for a blessing. This scene, recorded in Genesis 48, includes a seemingly odd statement by Jacob: "And as for me, when I came from Padan, Rachel died in the land of Canaan on the road...and I buried her there in the way to Ephrath, which is Bethlehem" (Genesis 48:7). Rashi, the great Torah commentator, notes that this was not a deathbed confession of negligence, but rather, Jacob was informing Joseph that "it was by Divine command that I buried her there..."
Rashi then refers to a series of verses from Jeremiah 31 that contain prophecy intended to comfort the Jewish people in their time of exile: "Thus says God, ‘A voice is heard in Ramah, lamentation, and bitter weeping, Rachel weeping for her children; she refuses to be comforted for her children, because they are not.’ Thus says God, ‘Refrain your voice from weeping, and your eyes from tears; for your work shall be rewarded,’ said God, ‘and they shall come back from the land of the enemy’" (Jeremiah 31:15-16). These verses are further elaborated on in Lamentations Rabbah. The midrash relates that after Abraham, Isaac, Jacob and Moses each plead with God to rescind His decree of exile against the Children of Israel, Rachel recounts how she had not only allowed her sister to marry the man she loved [Jacob] but even assisted her sister in the deception to spare Leah any shame. "And if I, a creature of flesh and blood, dust and ashes, was not envious of my rival...why should You [God]...be jealous of idolatry in which there is no reality and exile my children and let them be slain by the sword.’ The midrash then concludes that, ‘Forthwith, God’s mercy was stirred, and He said, ‘For your sake, Rachel, I will restore Israel to their place...’"
Tomorrow, the 11th of MarCheshvan, is the yahrtzeit of the Matriarch Rachel. When you pray, put your whole heart into your conversation with God. Deuteronomy 16:18 states: "...You shall not take a bribe, for bribery blinds the eyes of the wise and perverts just words." Although this statement of Jewish law is written in Deuteronomy, the final Book of the Torah, the concept of avoiding bribery is first found in Genesis 14. The patriarch Abraham is drawn into a regional war when his nephew, Lot, was taken captive when a group of Mesopotamian kings seized Sodom. Organizing his compatriots, Abraham and his followers attacked at night and defeated the invaders. When Abraham brought Lot and the rest of the captured citizens of Sodom home, Sodom’s king offered him all of the captured wealth in return for his subjects. Abraham responded: "I have lifted up my hand unto the Lord, God Most High, Maker of heaven and earth, that I will not take a thread nor a shoe-lace nor anything that is yours, lest you should say: I have made Abram [Abraham] rich" (Genesis 14:22-23). Abraham knew of the King of Sodom’s general lack of concern for others and did not wish to ever be beholden to him. The sage, Rabba, notes the deeper ramifications of Abraham’s refusal to accept even a small token of appreciation: "[Because of this response, Abraham’s] descendants were worthy of receiving two commandments:the thread of blue [tzitzit/tallit katan] and the strap of the phylacteries [tefillin]" (Sotah 17a). What is the connection between rejecting bribery and the mitzvot of tzitzit and tefillin? The answer can be summed up in Abraham’s response: "Lest you should say, I have made Abram rich." Tefillin, which are worn on one’s forehead and forearm, and tzitzit, which are attached to one’s clothing, are both mitzvot that are meant to be constant reminders of God’s omnipotence and of the fact that one should strive never to be beholden unto anyone except God. Be aware of how you are affected by other people’s actions and avoid being unduly influenced. It is a fact of history that students have frequently been at the center of radical movements, often under the influence of a teacher or mentor. This was the case of Rabbi Yonah of Geronah, who, following the lead of his teacher Rabbi Solomon of Montpellier, passionately called for a ban on the philosophical work of Maimonides, The Guide to the Perplexed. In fact, Rabbi Yonah is generally regarded as the instigator of the 1233 Inquisitional book burning of Maimonides’ work. Just under a decade later, Rabbi Yonah was himself witness to a far more threatening book burning of 24 wagon loads of the Talmud. He was deeply troubled by the fear that his own actions nine years earlier may have paved the path that led to this second book burning. According to tradition, he declared his error in condemning Maimonides’ work and vowed to visit Maimonides’ grave in Tiberias to beg for forgiveness from the legendary sage. In the 13th century, a journey to the holy land often took years. The first leg of his journey took Rabbi Yonah from Montpellier, France, to Barcelona, Spain, where he remained for three years before continuing on his way. He never made it to the Holy Land. When his travels took him to Toledo, the local community convinced him to assume a position as a Talmud instructor. It was meant to be a temporary situation, but on 8 MarCheshvan* 1263, he died suddenly from a rare disease. Rabbi Yonah was a renowned scholar, and his death was mourned by all of Spanish Jewry. Rabbi Yonah is best known for his moral/ethical works: Iggeret Ha’teshuva, Sha'arey Teshuva, and Sefer Ha’yirah (Letter of Repentance, Gates of Repentance and Book of Awe). One interesting additional fact about Rabbi Yonah is that his daughter married the son of his first cousin, Nachmanides, Rabbi Moses ben Nachmon. 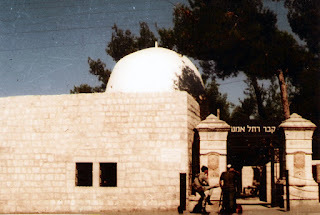 *Some sources list 27 MarCheshvan as the yahrtzeit of Rabbi Yonah. Do not hesitate to admit when you are wrong. 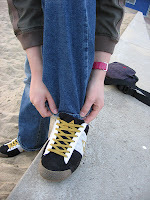 Our Rabbis taught: When one puts on shoes, he must put on the right first and then the left; when he removes [them], he must remove the left [first] and then the right. It is generally understood that this rule gives honor to a person’s stronger side (and therefore lefties do the opposite). Another perspective, however, might be that paying attention to small details keeps us focused on paying attention to the Divinity in the world. It also is intended to teach sensitivity to the limbs of our bodies, not to favor one foot over the other. How much more sensitive must we be in our relations with other human beings, to be careful not to unfairly favor one person over another. When getting ready in the morning, think about each action you take and feel grateful for your body’s abilities. Like many of the later prophets, the Book of Zechariah has more prophecy than narrative. 1) A man on a red horse, with three horses behind him, reports that all is quiet in the lands (1:8-12). 2) Four artisans cut down four horns of destruction and then rebuild the city (representing the four nations that destroyed Israel) (2:1-5). 3) He declares that Jerusalem will be rebuilt as a wall-less City of God--in this vision a man sent to measure Jerusalem is sent away (2:8-9). 4) The High Priest Joshua is defended by God from prosecution by the Satan. This vision contains a prophecy referring to Zerubbabel, the descendant of the Davidic line, who will complete the Temple (3:1-10). 5) A menorah with seven lamps and seven spouts is shown. Two olive trees nearby represent the "two sons [messianic figures] of oil who stand by the Lord..." (4:1-5). 6) A large scroll flies through the air, symbolizing a curse upon thieves and those who swear falsely (5:1-4). 7) A woman in a tub is carried in the air to the land of Shinar (Babylon) by two winged women. An angel explains that this symbolizes wickedness being expelled (5:5-11). 8) The most famous vision of Zechariah: Four chariots, harnessed to different colored horses, appear between "mountains of brass" and represent the four winds of Heaven (6:1-8). After these visions, Zechariah had silver and gold crowns made for Joshua and Zerubbabel. Chapters 9-14 of the Book of Zechariah are extremely complex. This section is generally divided into two prophecies. The first describes the coming of the Messianic age through the judgment on Israel’s enemies, the renunciation of all idols and a declaration of war upon tyrants. The second oracle predicts the future glory of Jerusalem, as well as the turmoil in the world that will lead to the Messianic age. As temperatures begin to drop, consider donating your old winter clothes to those in need. Kiddush, sanctification, is the prayer said over wine through which Jews proclaim the uniqueness of Shabbat and sanctify the day. Reciting or hearing Kiddush on Shabbat is an obligation for all adult Jews. The blessing is recited while holding up the kiddush cup in one’s dominant hand. Once the blessing is concluded, the person reciting the Kiddush drinks from the wine and distributes it so that everyone present can actively participate in the mitzvah. If every Jewish adult is required to sanctify Shabbat by reciting kiddush, why is it acceptable that kiddush is generally recited by only one person at the table? This same question can be asked, as well, regarding ha’mo’tzee (the blessing over the bread) that follows the recitation of kiddush? The custom of including numerous people in a blessing recited by one person is based on a concept* known as "Shomea K’oneh," which basically means "One who hears [a blessing] is equivalent to one who answers." More commonly, people refer to this idea as "being yotzei" (fulfilling their religious requirement). Fulfilling a mitzvah through someone else requires active listening. A person casually passing by who catches only the words "...borei pree ha’gafen" (...Creator of fruit of the vine) but fails to hear the full blessing, has not fulfilled the mitzvah of kiddush. The most important aspect of shomea k’oneh is intent. The sages declared: "If the hearer put his mind to it, but not the performer, or if the performer put his mind to it but not the hearer, he did not fulfill his religious duty; [one’s religious duty is not fulfilled] until both the hearer and the performer [simultaneously] put their minds to it" (Rosh Hashana 29a). Every piece of Jewish life, even when simply sitting at the Shabbat table while someone else recites kiddush, requires the active awareness of positive intent. *It is also based on the idea that b’rov ahm hadrat melech--the larger the audience, the greater the Glory of God. This Shabbat, make certain to focus your intent when either making or listening to kiddush. The sages wisely noted in Pirkei Avot (Ethics of the Fathers 4:1) that a truly wealthy person is one who is happy with his/her lot. Alas, dissatisfaction and the sense of being entitled to something more has frequently been the source of conflict throughout time. One might go back as far as the Tower of Babel to see the tragic results of territorialism. Although the story of the Tower of Babel is commonly known, most people know it only superficially: The people of Babel banded together to build a tower with the intention of overthrowing God. God’s reaction was to confound the languages of the people, resulting in the destruction of the tower and the dispersion of the people. There is, however, more to the story. The generation of the tower was the generation after the flood, and they were uniquely unified. Thus it is noted that "the whole earth was of one language and of one speech. And it came to pass, as they journeyed from the east..." (Genesis 11:1-2). It almost sounds like a utopian dream: the people of the world unified! They established cities wherever they chose, without any resistance or conflict. So why did these people choose to wage war against God? The Midrash states that when the people decided "Let us build us a city and a tower, whose top may reach unto heaven; and let us make us a name, lest we be scattered abroad upon the face of the whole earth" (11:4), they were, in fact, rising up against God, and saying: "He has no right to choose the celestial spheres for Himself and to assign to us the terrestrial world!" (Genesis Rabbah 38:6). The generation of the Tower was not satisfied with what they had, even though they had everything. So, they decided that they deserved access to the heavens as well as all of the earth. Assess the many blessings that you have in your life. Today is Rosh Chodesh Mar-Cheshvan, the first day of the month of Mar-Cheshvan, which is the eighth month of the Hebrew calendar. (The count of the months begins with Nisan.) Although the month is named Mar-Cheshvan, it is more commonly referred to as Cheshvan. During Mar-Cheshvan, the Jews celebrate...well, actually nothing. The uniqueness of the month is that it has no festivals, no days set aside for rejoicing, and not even a single fast day. In fact, its lack of holidays is why it is named Mar-Cheshvan; Mar means bitter. The eighth month was not always called Mar-Cheshvan, which is a word most probably of Babylonian origin (as are many of the names of the months). When mentioned in Biblical sources it is referred to either as “the eighth month” or Bool (see I Kings 6:38), a word closely related to the Hebrew word mabool, meaning flood. According to tradition, the 17th of Cheshvan was the start of the great flood that took place in the time of Noah and destroyed the world. Just over a year later, on the 27th of Cheshvan, Noah and his family discovered that the waters of the flood had completely receded. The kabbalists also believe that Cheshvan is the month in which the Messiah will arrive. However, in Talmud Sanhedrin 97a, Rabbi Zeera tries to discourage such calculations by quoting an earlier teaching that “Three things come from nowhere: Moshiach (the Messiah), a found article and [the bite of] a scorpion.” The mention of the scorpion is interesting because Cheshvan is associated with the zodiacal sign of the scorpion. This Treat was first published on October 19, 2009. Enjoy a special treat in honor of Rosh Chodesh. It is a fundamental Jewish belief that in the era of the Messiah, the world will be transformed into a state of perfection. As stated by Rabbi Moses ben Maimon (Rambam, Maimonides - 12th century, Egypt): “At that time, there will be no hunger or war, no jealousy or rivalry” (Mishneh Torah, Law of Kings 12:5). On “World Food Day” (October 16, 2012), a world without hunger indeed seems utopian. The question facing modern leaders, scientists and economists in this age of potential food shortages (and, indeed, severe hunger in some countries) is how to achieve this much-desired goal. Environmentalists might suggest planting fields of more efficient crops. Malthusians might suggest population control. A rabbi might suggest focussing more on mitzvot and prayer. The solution suggested by the rabbi may seem to lack concrete implications, but a closer look proves the rationale behind the solution. Doing a mitzvah is more than just doing a good deed. The mitzvot of the Torah include actions such as leaving the corner of the field to be harvested by the poor (or in the era of global economics, providing for those who lack agricultural options). Other appropriate mitzvot include Shmittah (leaving the fields fallow every seven years to maintain the soil’s agricultural health), and Bal Tashchit (not wasting) - not to mention the well-known mitzvah of tzedakah, charity. What of prayer? In addition to prayer being the metaphysical supplication for Divine intervention, Jewish prayer (in Hebrew: L’hitpallel) is expected to be introspective. One may thus expect that a person praying for assistance with global hunger issues will also reflect on what small acts he/she might perform in order to help find a solution to the problem. Joining in prayers and performing mitzvot as a means of addressing the global issue of hunger, does not, of course, negate the appropriateness of participating in programs, organizations and movements that seek additional solutions. It is, however, an important tool accessible to all people. Try to reduce the amount of excess food (food that you often do not eat before its expiration date) that you purchase. "Kidah means falling upon the face, as it says (I Kings 1:31), ‘Then Batsheva bowed with her face to the earth." Keri’ah means going down upon the knees, and so it says (I Kings 8:54), ‘[Solomon rose] from kneeling on his knees.’ Hishtachavayah is spreading out the hands and feet, as it says (Genesis 37:10), ‘Shall I and your mother and your brothers come to prostrate ourselves before you to the earth?’" (Megillah 22b). The Jewish aversion to bowing stems from two Biblical sources. The first is Leviticus 26:1, which states : "...neither shall you place any figured stone in your land, to bow down unto it..." The second traditional source is Mordechai’s refusal to bow down to Haman in the Book of Esther. In the daily prayer services, however, Jews not only bow four times during the Amidah (silent, standing prayer), but at several other points in the daily service as well (Barchu, Aleinu). It is therefore important to note that the Hebrew term specifically prohibited in Leviticus 26 is Hishtachavayah, full prostration of hands and feet. Nevertheless, Jews tend to refrain from bowing in any other manner as well. Practically, of course, there are exceptions. One might bow in front of a king or queen if that is the customary way of paying respect to royalty. If one were in Japan, one might bow when greeting others, as is the custom of the country. One might not, however, bow to any animal, in front of a statue or any other inanimate object. Remember to respect your own heritage even as you respect that of others. On August 3, 1492, Columbus’ three ships set sail from Spain. But did you know that August 2, 1492, was Tisha B’Av, the Fast of the 9th of Av, and the date by which all Jews were required to convert to Catholicism or leave Spain, as proclaimed by King Ferdinand and Queen Isabella? The strange coincidence of dates has resulted in much speculation regarding Columbus’ possible Jewish origins (of which there has been no substantial proof). Others have suggested that Columbus’ crew included Jews trying to escape the wicked decrees. This seems unlikely given that the one known Jewish member of Columbus’ crew, Luis de Torres, had undergone conversion in order to join the Spanish exploration party. Columbus chose Luis de Torres as his interpreter because of his knowledge of Hebrew, Aramaic, Spanish, Portuguese, French, Latin and some Arabic. It seems that the great explorer expected to encounter descendants of the Ten Lost Tribes in Asia. When they arrived at what is now Cuba, the first inhabited island they found, Columbus sent Luis de Torres and Rodrigo de Jerez to explore the island. Thus a Jewish man was one of the first to interact with the native residents of the New World. Unfortunately, one of Columbus’ three original sailing vessels, the Santa Maria, ran aground. While most of the crew of the Santa Maria were transferred onto the Nina (the Pinta had already been lost at sea), 39 men, including de Torres, were left behind to establish La Navidad, the first European settlement. History is unclear regarding Luis de Torres’ fate. While some historians believe they have found records of annual payment to him from the Spanish government, most believe that he was massacred along with the other settlers after being accused of accosting the native women. This Treat was originally posted on October 12, 2009. At the Shabbat table, use Jewish history as a springboard for discussing Jewish life. In school students receive As, Bs, Cs, Ds and Fs. Students, however, often comment that they at least deserve an E for effort. This comment reflects an important life lesson that is taught in the very first chapters of the Torah in the story of Cain and Abel. "And in process of time it came to pass, that Cain brought of the fruit of the ground an offering to the Lord. And Abel, he also brought of the firstlings of his flock and of the fat thereof. And the Lord had respect for Abel and for his offering; but for Cain and for his offering He had not respect. And Cain was very angry, and his countenance fell....(Genesis 3:3-5). Taking a closer look at the introduction to this tale of sibling rivalry, one can almost understand why Cain was angry. In fact, it was Cain’s idea to bring an offering in the first place. But whereas Cain brought some of his vegetables (he was a farmer), Abel, a shepherd, brought the firstlings of his flock - those being of the finest quality. "Why are you angry, and why is your countenance fallen? If you do well, shall it not be lifted up? But, if you do not do well, sin couches at the door; and unto you is its desire, but you may rule over it" (Genesis 3:6-7). In other words, Cain had the ability to improve, all he needed was to put forth the effort of choosing the finest produce for an offering. Alas, Cain took the low road. He called his brother to a private conversation and then murdered him. He could not take personal responsibility for his own shortcomings. Each of us, in every generation, however, is meant to keenly absorb the lesson that God was trying to teach Cain. We must each take responsibility for our own actions and always strive to do our best. Recognize that the amount of effort you put into every act reflects in its success. Today, October 10, 2012, is the last day of "World Space Week." The heavens and the stars have always fascinated humankind. They are so distant, so vast and, as so eloquently pointed out by the Creator Himself, so seemingly infinite ("...Count the stars, if you be able to count them" - Genesis 15:5). According to the Torah, the firmament of heaven was created on the second day of creation (Genesis 1:6-8), while the planets and stars (and all the other objects of outer-space) were created on the fourth day of creation: "And God made the two great lights: the greater light to rule the day, and the lesser light to rule the night; and the stars. And God set them in the firmament of the heaven to give light upon the earth" (Genesis 1:16-17). "...twelve constellations have I created in the firmament, and for each constellation I have created thirty hosts, and for each host I have created thirty legions, and for each legion I have created thirty cohorts, and for each cohort I have created thirty brigades, and for each brigade I have created thirty camps*, and to each camp I have attached 365,000 of myriads of stars..."
Despite the absence of telescopes or satellites, the sages well understood the vast distances of the universe: "Now from earth to heaven is a five hundred years journey, the thickness of heaven is a five hundred years journey, and between the first heaven and the next lies a five hundred year journey, and similarly between each heaven...[there being seven heavens]" (Pesachim 94b). And while there is much to learn about this "final frontier," for humankind, space has, does and always will serve as a source of breathtaking inspiration. *Hosts, legions, cohorts, brigade and camps are all ancient units of soldiers. Look up at the sky and be inspired to connect to the Creator. The days of judgment are not, it seems, truly over until the seventh day of Sukkot, which is why some perform the tashlich ceremony until Hoshana Rabbah. What is the connection? Since God is still sitting in His heavenly courtroom deciding the fate of the world, there is time to slip in a final appeal or to do an extra act of kindness in the hope of altering the scales of justice in one’s favor. Because Hoshana Rabbah is considered a day of judgment, selichot (penitential prayers) are added to the morning service, in addition to the special prayers of Sukkot. Hoshana Rabbah 5773 begins on Saturday night. This Treat was originally published on October 6, 2009. Sunday night starts the holiday of Shemini Atzeret, literally the Gathering of the Eighth, a connected, yet independent holiday, that immediately follows Sukkot. During the morning service, all the Torahs are again taken from the ark, and the hakafot, the joyous circling of the night before, are repeated. The final parasha (weekly portion) of the Torah, V’zot Ha’bracha (And this is the blessing...) is read. The final parasha is read over and over until everyone has been called to the Torah. In some congregations, several Torah readings take place simultaneously. *This Treat was originally published on Monday, October 20, 2008. Enjoy Shabbat dinner under the stars (in a sukkah). The message of Kohelet is perhaps best summed up in the following verses: "I have seen the task which God has given to the sons of men to be exercised therewith. He has made everything beautiful in its time;... man cannot find out the work that God has done from the beginning even to the end....But also that every man should eat and drink, and enjoy pleasure for all his labor, is the gift of God" (3:10-13). Sukkot is considered the holiday on which God determines the world’s water allotment for the year to come. During the time of the Temple, the week of Sukkot was highlighted by the Water Libation ceremony, during which water was poured over the altar after the morning offering. The ceremony actually lasted all night and was known as the Simchat Beit Hasho'evah, the Celebration of the House of the Water Drawing. Here is a description of how it was celebrated in the Temple: The Temple was set up for the Simchat Beit Hasho'evah. Three balconies were erected in the women’s section and the men would stand in a courtyard below, allowing more people to attend. Golden lamps were placed in the courtyard that gave off enough light to illuminate the entire city. In the courtyard, men would dance as the Levites played instruments and sang praises to God. The kohanim, the priests, would then go to the Gichon Spring and draw the water to be used. This Treat was originally published October 17, 2008. Find out if there is a Sukkot Across America location near you! Walk into a traditional synagogue in the middle of morning services during the week of Sukkot and you might have to take precaution not to be trampled upon by the circle of attendees walking around the bimah (central table where the Torah is read) shaking their lulavim. The hoshanot service has been part of the celebration of Sukkot since the days of the Holy Temple, when, according to the Mishna: “It was customary to make one procession around the alter on each day of Sukkot, and seven on the seventh day” (Sukkot 4:5). The name of the service, Hoshana, is derived from the opening word that is repeated throughout the first prayer: Hoshana. This word is actually a contraction of two separate words and means “Please save!” The congregants open the ceremony by beseeching God to save His people “For Your sake, Our God!” “For Your sake, our Creator!” “For Your sake, our Redeemer!” and “For Your sake, our Attender!” Each cry is preceded and followed by “Hoshana” (Please Save!). See below for a Jewish Treat on the symbolism of the lulav and etrog. This Treat was originally posted on Monday, October 13, 2008.